Remember those souless lentil loaves from the 70’s pretending to be healthy meatloaves? No? Well, let me describe one for you: brown, pasty, tasted like cardboard, squishy, gross and h-e-a-v-e-y. 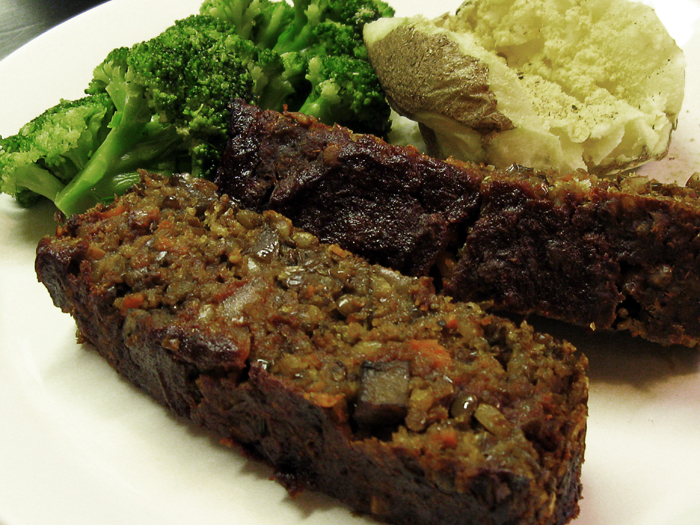 Yeah, that one lentil brick I tasted as a kid in the 70’s prevented me from trying any modern, updated vegan meatloaf—no matter what the ingredients. To me, there was no way to pull this off…until now. Let me start by saying I wasn’t really able to shave off significant amounts of time from this recipe for my favorite Tired Wenches. It’s critical to the flavor depth of this meatless loaf that you NOT skip any ingredients or steps. At the end of this post I’ll list some ideas for saving time but they’ll mostly involve advance prep-work. Reprinted here with permission by Allison Rivers Samson from her VeganizeIt! column in VegNews magazine. Any changes on my part are in parentheses. 4 servings, if you aren’t me. Preheat oven to 350F (I waited to do this until I was in the final mix because I’m a slow cook.) Line a small loaf pan with parchment paper and set aside. In a small bowl, combine the tomato paste, 2 tablespoons tamari, agave, liquid smoke, and 1 tablespoon garlic. Set aside. Heat a large skillet over medium heat, add 2 tablespoons margarine and 1/2 cups onions. Saute 5 minutes. Add the portabello mushrooms and saute for 7 minutes. Transfer to a small bowl. Add remaining 2 tablespoons margarine to the skillet and saute the celery, carrot, remaining 2 teaspoons garlic, salt and pepper over low heat. Cover and cook for 10 minutes, stirring occasionally. In a food processor, pulse the rice and lentils 10 times, then transfer to a large bowl. In the food processor, pulse the cooked carrot/celery mixture with Worcestershire sauce, remaining tablespoon of tamari, mustard, parsley, arrowroot and 1/3 cup of the tomato topping 10 times. Add this mixture to the bowl with the lentils. Fold in the reserved sauteed onions and mushrooms, breadcrumbs, and the 1/2 cup chopped onion. Press half of the mixture into the prepared loaf pan and spread the top with half of the tomato topping. Press remaining loaf mixture in the pan then coat the top with the last of the tomato topping. Cover with foil and bake for 45 minutes, Uncover and bake an additional 15 minutes until top is browned Remove from oven and cool for 20 minutes before serving. Tip to keep the loaf moist: when processing the veggies, don’t strain them from the margarine you used during sauting. Dump the margarine from the skillet into the processor as well. EZ tip: prepare the meatloaf on Sunday then assemble and bake on Monday after work. Nuke some frozen broccoli and a potato and you’ve got dinner! Make a stash of lentils and rice up to 3 days prior. Use a veggie broth instead of plain water and you can use them for other things too (just cut back on the salt in the recipe if you use salted broth). Good weekend activity for when you’re mad at hubby. This tomato topping would make a great topping for burgers or hotdogs so I recommend making a batch of it to keep in the fridge. Then you can just pull it out like we used to with ketchup on past meatloaves. Celery, carrots and onions can always be chopped and stored in little airtight containers in the fridge. Garlic however will lose some of it’s potency if you try this time saver. Dry herbs are a time saver if you don’t have fresh. Use panko or other boxed breadcrumbs so you don’t have to make your own. Let the parchment paper extend over the sides of the pan and it’s super easy to pull the loaf out when it’s cooled down. And of course, MY FAVORITE IDEA, make the meatloaf mixture on a Sunday then assemble and bake it Monday night for dinner. Plan 1 hour for baking and 20 minutes cooling time to set the table, make a side salad and nuked potatoes with Teese® or Daiya® cheese. This looks awesome – this is one of the items I’m really looking forward to trying. It’s funny that I actually have fond memories of meatloaf, instead of the way you see it depicted on TV. I may try your idea of pre-making the mix the night before – it might actually deepen the flavor that way. Great suggestions and tips, Julia! Can’t wait to hear how you like it tomorrow or the next day, when the flavors marry. Heather, too bad we don’t live closer, we could compare a made ahead version to regular. can i ask about lentil yield? Does 1 cup dry = 2 cups cooked? Do you mean 2 cups dry? UGH, I hate lentil math. Thanks, Julia. I ended up doing 1 cup lentils and didn’t bother measuring them after cooking. I’m slowly becoming more carefree with my cooking and stopping stressing about measurements. My loaf is waiting at home for me this evening … can’t wait. My daughter decided to go vegan, not sure if it’s a phase and I couldn’t decide on what base for comfort food “meatloaf” since it’s the season, so I tried three at once. This was the one for me! It’s awesome, came out just like meatloaf and very flavorful, it is a fairly labor intensive recipe, the recipe is arranged properly so it’s not French Chef complexity. Thank you so much, with what I froze and sandwiches for the work week we are set with a great meatless alternative. Oooo, I didn’t think about saving some for sandwiches. Great idea!